JERUSALEM – A biblical wall that has eluded archaeologists for years has finally been found, according to an Israeli scholar. A team of archaeologists in Jerusalem has uncovered what they believe to be part of a wall mentioned in the Bible’s Book of Nehemiah. The discovery, made in Jerusalem’s ancient City of David, came as a result of a rescue attempt on a tower which was in danger of collapse, said Eilat Mazar, head of the Institute of Archaeology at the Shalem Center, a Jerusalem-based research and educational institute, and leader of the dig. Artifacts including pottery shards and arrowheads found under the tower suggested that both the tower and the nearby wall are from the 5th century B.C., the time of Nehemiah, according to Mazar. Scholars previously thought the wall dated to the Hasmonean period (142-37 B.C.). I have long been a fan, so to speak, of Nehemiah. He heard of a problem, prayed to God, and was used of God to do an important work in spite of severe opposition. He was persecuted, frustrated, but continued to pray and to rely on God and did the work his “era” was supposed to accomplish. Despite his flaws, he understood the priority that the work of God was supposed to have. Nehemiah A four minute, sometimes silly, Lego-animation related to Nehemiah and rebuilding the walls of Jerusalem. Persecutions by Church and StateThis article documents some that have occurred against those associated with the COGs and some prophesied to occur. IT IS DONE! We have completed all the final editing and compiling of the new Bible—The Holy Bible In Its Original Order. Thursday, November 15, John and Hiedi Vogele shipped, via UPS Air International Express, the complete hard copy of the Bible text, commentaries and appendices—1416 pages total, plus two CDs—off to the printer. Additional “backup” copies of the CDs—which contain all the formatted pages of the entire Bible—were sent in a separate air express package. The manufacturer, LithoPak, Inc. of Hong Kong, China, will immediately begin the process of printing and binding this beautiful new Bible. It will be approximately 60 days until we receive them through the port of Oakland, California, and begin mailing them to you. You will be pleasantly surprised, delighted and enthusiastic when you see the beautiful artwork on the front and back of the presentation box, and the gold-stamped, handcrafted lambskin cover. The paper is a special high-quality French Bible paper with gold-gilded edges and two marker ribbons—one black and one gold. It will be triple bound—Smythe stitched, spine stitched and glued. The scriptural text pages have wide margins for study notes and center column references with scriptural studies and additional explanations of critical words. And, although it is composed of 1416 pages, it is only 1-3/8 inches thick. Beyond its physical appearance, the most important aspect of this new Bible is that it is the first Bible—with the Old and New Testaments together—ever printed in the original God-inspired manuscript order. CBCG has been working on this project for close to a decade. They came out with the New Testament translation several years ago, and a second revised edition of it three years ago. It is interesting to me that they have it made in China. I have read, and sometimes cited their NT version, which they call FV-A Faithful Version. While all translations have errors and I do not agree with how some passages have been translated, I do believe that FV can be helpful, and I do cite from it in many articles. We in the COGs have long been aware that the order that the books of the Bible normlly appear in is not the same as what appears to have been the original order. Christian Biblical Church of God and its Teachings Fred Coulter’s group–they also tend to explain conspiracies, calendar issues, and have an interesting “sea of glass” teaching. Plus they produce books on various subjects. Yes, around the world, people are shopping for Christmas celebrations. No, essentially to celebrate an ancient winter festival. However, it has been outlawed from time to time. Increasingly in the late sixteenth and early seventeenth centuries, many people, especially the more Godly, came to frown upon this celebration of Christmas, for two reasons. Firstly, they disliked all the waste, extravagance, disorder, sin and immorality of the Christmas celebrations. Secondly, they saw Christmas (that is, Christ’s mass) as an unwelcome survival of the Roman Catholic faith, as a ceremony particularly encouraged by the Catholic church and by the recusant community in England and Wales, a popish festival with no biblical justification – nowhere had God called upon mankind to celebrate Christ’s nativity in this way, they said. What this group wanted was a much stricter observance of the Lord’s day (Sundays), but the abolition of the popish and often sinful celebration of Christmas, as well as of Easter, Whitsun and assorted other festivals and saints’ days. In the early 1640s, as power passed from Charles I (who largely supported the existing rituals and festivals) to the Long Parliament, parliament began the process of clamping down on the celebration of Christmas, pressing that ‘Christ-tide’ (as they preferred it called, thus doing away with the ‘mass’ element and its Catholic echoes) should be kept, if at all, merely as a day of fasting and seeking the Lord. In January 1642, shortly before civil war began, Charles I had agreed to parliament’s request to order that the last Wednesday in each month should be kept as a fast day; many hoped that Christ-tide, 25 December, would come to be seen and kept as just an addition to these regular fast days. The Long Parliament, in fact, met and worked as usual on 25 December 1643. In late 1644 it was noted that 25 December would fall on the last Wednesday of the month, the day of the regular monthly fast, and parliament stressed that 25 December was strictly to be kept as a time of fasting and humiliation, for remembering the sins of those who in the past had turned the day into a feast, sinfully and wrongfully ‘giving liberty to carnal and sensual delights’. Both Houses of Parliament attended intense fast sermons on 25 December 1644. In January 1645 a group of ministers appointed by parliament produced a new Directory of Public Worship, which set out a new church organisation and new forms of worship to be adopted and followed in England and Wales… Parliamentary legislation adopting the Directory of Public Worship, initially as one of several forms which could be followed in England and Wales, but then as the only form which was legal and was to be allowed, abolishing and making illegal any other forms of worship and church services, therefore prohibited (on paper at least) the religious celebration of all other holy days, including Christmas. In June 1647 the Long Parliament reiterated this by passing an Ordinance confirming the abolition of the feasts of Christmas, Easter and Whitsun, though at the same time parliament said that the second Tuesday in each month was to be kept as a non-religious, secular holiday, providing a break for servants, apprentices and other employees. During the 1650s parliamentary legislation was passed to reinforce the structure that had been put in place by the end of the 1640s. Specific penalties were to be imposed on anyone found holding or attending a special Christmas church service, it was ordered that shops and markets were to stay open on 25 December, the Lord Mayor was repeatedly ordered to ensure that London stayed open for business on 25 December, and when it met on 25 December 1656 the second Protectorate Parliament discussed the virtues of passing further legislation clamping down on the celebration of Christmas (though no Bill was, in fact, produced). Legislation was passed to ensure that Sundays were even more strictly observed as the Lord’s Day, but the holding of a regular monthly fast on the last Wednesday of the month, which had never proved popular or been widely followed, was quietly dropped. Mother is remembered for a skip in her step and a songbirg’s “hello” for each of us. Our days began with the sound of Mom in the pre-dawn kitchen promising a sunlit day. This prepared us for each day and Mother then had time to enjoy her garden. Her pioneer spirit of mid-west origin had opportunity to mingle with metropolitan and even global society. In this she was friendly and had a kind or at least a considered and tempered word for all she encountered. Like a tree in a favorite sitting place, memory of her gives moment to contemplate the gravity of life’s journey. The family wishes to thank you for your thoughtful and heartwarming cards and letters which supported us and our Mother over the last few years. There will be a private service for family only. Donations in her memory can be made to your local food bank. Her late husband, Herman Hoeh, died in 2004. He was one of the five originally ordained evangelists by Herbert W. Armstrong on December 20, 1952, but strangely did not leave WCG when it changed. Only one of the five original evangelists is still alive (RC Meredith, who is with the Living Church of God). On other matters WCG, the AW site shows a brochure featuring Joseph P. McNulty which states that he was “the exclusive financial advisor to the property owner, the Worldwide Church of God” and states that the old Ambassador Campus was sold in three parcels for an amount exceeding $125,000,000 (this money was basically used to fund the retirements for those who accepted the changes at WCG). The November 2007 issue of UCG’s United News arrived this weekend. This is the issue that contains its audited financial statements. For its fiscal year ending 6/30/07 UCG grossed $23,368,688. It spent 5,071,989 (21.71%) for ‘public proclamation’; it spent 4,220,138 for managing its meetings and ‘home office’ (18.06%); and 12,553,205 (53.72%) for the field ministry/local churches/FOT/International support, and increased reserves by 1,520,853. On the other hand, for its fiscal year ending 12/31/06 LCG grossed 10,352,593 and spent 4,429,377 on public proclamation, 711,651 on HQ administration, 5,210,756 to ‘feed the flock’ and increased reserves by 809. I went with LCG, and not UCG, because of Gospel and governance. It is interesting that UCG spent about 3 times as high a percentage on governance than LCG does (and over 5 times as much in actual cash, UCG spent $4,220,138 vs. LCG’s 711,651). Which form of governance is more cost-effective? Which form places the higher priority on proclaiming the Gospel? With half the income, produces nearly twice the number of magazines (Tomorrow’s World vs. Good News) on a per member basis than UCG does. LCG has also reached over 13,000,000 via television. According to published data that I have seen, the number who respond to LCG’s telecast EACH MONTH exceed the total who have ever responded to UCG’s telecast since inception. While I no longer consider that UCG’s gospel efforts are “cold” as they once were, they still could not be categorized as “hot”. But UCG has made major improvements in this area–and will most likely do so in the current fiscal year (it increased its budget for this). UCG, however, also continues its trend of saving a significant portion of its income each year. I believe that this will be used by UCG to pay salaries, etc. during more difficult economic times. And while those times will certainly be coming, and some reserves are wise, should this nearly always continue to be UCG’s practice? 6. The Philadelphia Church Era was predominant circa 1933 A.D. to 1986 A.D. The old Radio Church of God and old Worldwide Church of God, now LCG. There are Many COGs: Why Support the Living Church of God? This is an article for those who wish to easily sort out the different COGs. It really should be a MUST READ for current and former WCG members or any interested in supporting the faithful church. Britain to Become Absorbed in the EU? The photo above is of an ancient carving of Euro who is supposed to be the southeast wind. And political winds will be blowing in Europe and seem to be in Australia. They plan to ratify the Reform Treaty in the Summer of 2008. This means Westminster will pass the treaty, and the Queen will sign it behind our backs, as she has the other five treaties. The EU has chosen this sixth Treaty instead of pushing through it’s constitution to avoid referendums in its member nations. Thirty three years inside the EU – have you noticed how our democracy is being withdrawn? The EU has already denied us that most basic of human rights – the right to vote against the EU and to keep our own nation. A majority of us don’t want to be in the EU. We are being forced in against our will. Do you feel you’ve become powerless, unable to influence events, or your vote is worth less? The six treaties have been gradually removing our democracy; for thirty years our laws have been “harmonised” with the EU; 80% of the laws now passed by our Parliament are EU laws, not ours. Isn’t the real reason people have lost interest in politics precisely because the EU has taken away our ability to change things? Common law, where the government was our servant, is now largely replaced by the EU’s Corpus Juris, which puts the government above the law, and we don’t participate. We have already lost most of our rights (including habeas corpus). The power of government grows unchecked, as does that of large corporations. Politicians continuously lie about the EU, pretending its not significant. The EU’s Hitler will have a much easier rise to power, and will have the formerly British and French nuclear weapons from day one. Adolf Hitler killed 54 million people. The EU’s dictator could kill a billion at the touch of a button, with no democratic checks and balances to answer to. How could any aspiring dictator resist the EU opportunity? (Source: http://eutruth.org.uk visited 11/19/07). A military leader, eventually more destructive than Adolf Hitler, will arise in the European region. While the United Kingdom of Great Britain, Scotland, Wales, and Northern Ireland may temporarily be part of the EU, biblical (and sometimes Catholic) prophecies indicate that they will be be conquered by the final leader of a revived European “Holy Roman Empire”. Despite the fact that in yesterday’s vote in Australia, John Howard (its pro-USA prime minister) was voted out to be replaced by Kevin Rudd (who is much less supportive of the USA ), we in the COGs tend to believe that the USA, UK, Australia, and New Zealand will probably have some type of greater economic unity before the end and that they will all be destroyed by the final King of the North. Any temporary distortions to this are considered to be simply temporary. Who is the King of the North? Is there one? Do biblical and Roman Catholic prophecies point to the same leader? Should he be followed? Who will be the King of the North discussed in Daniel 11? Posted in Prophecy | Comments Off on Britain to Become Absorbed in the EU? VATICAN CITY (Reuters) – Pope Benedict and his cardinals discussed Catholic relations with other Christians on Friday, highlighting efforts to work closely with the Orthodox and to meet the challenge of fast-growing Protestant churches. It is interesting that the Eastern Orthodox are accepting Roman primacy (which they have done in the past), but that not all of the Orthodox are yet of the same mind. He says that millenarian beliefs are fairly widespread in Russian Orthodoxy, both within the formal structures of the Church and outside it (Waiting for Armageddon. BBC – Nov 21, 2007. http://news.bbc.co.uk/2/hi/europe/7101727.stm). It is of interest to note that the millennial reign of Christ on the earth is the only doctrine that the current “Catechism of the Catholic Church” (which was approved by Cardinal Ratzinger prior to him becoming Pope Benedict) mentions in association with Antichrist, even though early leaders that the Catholics and Orthodox consider to be saints taught it. The Russian Orthodox also seemed to accept the possibility of the seventh day Sabbath centuries after the Eastern Orthodox distanced themselves from it completely. Did The Early Church Teach Millenarianism and a 6000 Year Plan? Was a 6,000 year time allowed for humans to rule followed by a literal thousand year reign of Christ on Earth (often called the millennium) taught by the early Christians? Is this time near? Historically, the U.S.-Canadian Church has not seen itself as a global administration but as one among many conferences of the Church of God (Seventh Day) around the world. It was only in 1978 that the International Ministerial Congress was formed to foster doctrinal harmony and to coordinate the evangelistic efforts of its members. But through G. C. Missions, the General Conference is becoming more and more a church with global vision and more at ease with the term “world church.” Therefore, Cristo Viene is apropos because it calls the whole Church to take the whole gospel to the whole world. The gathering of the congress in Overland Park this summer is a good opportunity to observe the increasing global presence of our church and the role of G. C. Missions in this growth. It is good that CG7 is realizing that they should cooperate more and assist their brethren outside the USA and Canada. The Bible itself says to preach to the whole world. Hopefully, the leadership there at CG7 will also realize that understanding biblical prophecy correctly also should be part of the mission. 5. The Sardis Church Era was predominant circa 1600 A.D. to circa 1933 A.D. This article also discusses the early history of the Seventh Day Baptists, Seventh-day Adventists, and COG-7th Day. Today is the American holiday called Thanksgiving. Unlike most holidays observed in the USA, this one is not of pagan origin. Hence, the vast majority in the Church of God (COG) consider it an “optional” (not biblically-required) holiday, and most in the USA COGs seem to observe it. In Canada, Thanksgiving is celebrated on the second Monday in October. It is the only other country outside of the United States that officially observes the day as a holiday. Jesus Himself seemed to observe a national Jewish, as opposed to a biblical, holiday called the Feast of the Dedication in the New Testament as He went to the Temple during it (John 10:22-23). As Americans know, the history related to the USA Thanksgiving involves a group of people commonly known as the Pilgrims. They were a dissenting religious group considered to be outside of mainstream “Christianity”. The Pilgrims felt that the only way freely to practice their religion was to physically separate themselves from the Church of England that had persecuted them. First to flee persecution, these “Separatists,” moved to the English Midlands. Then they went to Amsterdam in 1607. In 1609, they moved to the more religiously tolerant Netherlands. But they decided that this would not do. Finally, they began their voyage to America in 1620. It took months to cross the sea and they lost many during that voyage as well as after coming to America.. 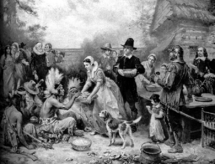 In spite of all their sufferings and the death of half of their company, in October 1621, the Pilgrims celebrated their first harvest. In 1863, US President Lincoln made a proclamation that ultimately led to Thanksgiving becoming a US holiday. 4 Sing praise to the LORD, You saints of His, And give thanks at the remembrance of His holy name (Psalm 30:4). 14 Offer to God thanksgiving (Psalms 50:14). It is certainly appropriate to thank God for calling us, blessing us physical, and for the opportunity to understand the purpose of life and God’s way of life, the sacrifice of Jesus, and for the opportunity for salvation that He has given to us. We can be grateful for the understanding of God’s great plan that the Kingdom of God will bring peace and abundant prosperity. Despite the fact that we and the peoples of the world will punished for our sins, God does have a plan to bring peace and prosperity (see the article Did The Early Church Teach Millenarianism and a 6000 Year Plan?) and will offer salvation to all (please see the article Universal Salvation? There Are Hundreds of Verses in the Bible Supporting the Doctrine of True Apocatastasis). In November 1998, the old board of directors of the Global Church of God removed evangelist Carl McNair from the board on the trumped up charge of “failing to protect corporate assets” and replaced him with a lawyer. What did Carl McNair actually do to be removed from the board? He allowed RC Meredith the presiding and founding evangelist of the then Global Church of God to have access to the mailing list of the church. Although it never did have a majority of support from the old GCG Council of Elders, the new board after removing Carl McNair had enough members to then takeover GCG and fire RC Meredith. Anyway, during Thanksgiving week of 1998, on or near the day he was removed from the board, RC Meredith, after consulting to insure he still had legal authority to do so, signed a few checks to repay on-demand loans from a few individuals who asked to be repaid. The new board, even though it had plenty of cash, later stopped payment on those checks, spent the money on those supporting the takeover, and essentially went bankrupt about ten months later. The reason for the takeover according to supporter Larry Salyer (now with UCG) was the fact that the new board disagreed with hierarchical governance. At that time he wrote, “the real issue IS government” (Salyer, L. Information Update, 11/25/98 from larry.salyer@gcg.org). Jesus Christ never intended His Church to be run autocratically, and He never set one person over His Church…Christ fully realized that power corrupts and that absolutely power corrupts absolutely (McNair Raymond. Letter to Council of Elders. Church Government in the New Testament). For a general article on government, please read the article Should a Christian Vote? Those who were once part of the old WCG know Herbert W. Armstrong was opposed to the type of governance that Larry Salyer and Raymond McNair advocated. Herbert W. Armstrong taught that proper church governance was one of the 18 Truths Restored to the Churches of God during the Philadelphia Church era. I felt, then and now, that without having proper governance, that any COG would simply not have the fruits that the remnant of the Philadelphia Church era should have. You will know them by their fruits. Do men gather grapes from thornbushes or figs from thistles? Even so, every good tree bears good fruit, but a bad tree bears bad fruit. A good tree cannot bear bad fruit, nor can a bad tree bear good fruit. Every tree that does not bear good fruit is cut down and thrown into the fire. Therefore by their fruits you will know them (Matthew 7:16-20). So what were the fruits? Well, the old GCG went bankrupt, its replacement organization (CGCF) was shut down, and most who supported the takeover scattered to various groups. In total, the organized groups that came out of those who supported the takeover seem to have less than 1,200 people who attend with them. None seem to have had any significant ability to proclaim the gospel through television or radio. Nor have they had many baptisms. However, one group is different, as it was made up of those opposed to the takeover. The Living Church of God began to form in December 1998 and became a truly functioning entity in January 1999. It had about 5,000-5,300 attendees (including unbaptized children) then. LCG is, as of 11/20/07, on 206 television and 14 radio stations around the world. It sends out over 330,000 copies of its Tomorrow’s World Magazine. It has reached millions through television, plus millions through the internet. 3,800 television listeners contact it each week requesting more information. As of 11/09/07, LCG has had over 2,600 baptisms–which is about twice as many people than all the other groups that came out of GCG have attendees in total. LCG is the only group to have the type of fruits that Jesus told His followers to look for. More information about many of the groups that had some type of GCG affiliation, but are not now part of the Living Church of God can be found at the News of Those Once Affiliated with the Global Church of God. An article of possibly related interest may be There are Many COGs: Why Support the Living Church of God? You are currently browsing the Church of God News weblog archives for November, 2007.